Every pooch or kitty needs to have a party hat on their birthday! 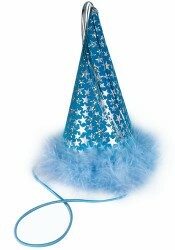 This adorable hat features silver stars, a soft feathery trim and silver tassles for extra flair. The adjustable elastic fits easily under your pet's chin.